Press photograph, approximately 20 x 25cm on card. 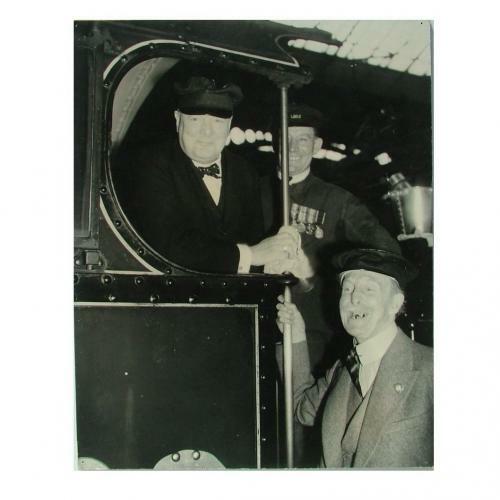 Shows Winston Churchill (before he became prime minister) in a driving cap on the footplate of a railway engine. Captioned to rear 'Winston Churchill names new railway engine - Mr Winston Churchill this afternoon named a new LMS engine, Royal Naval Division, at Euston Station. A detachment of the RNVR wre present'. Dated June 5th 1937. Very light foxing/soiling and has pin holes in each corner. Caption to rear is partially torn. Stock code P21282.